Death, rebirth and acceptance of who or what we are: heady subjects to say the least. Michael and Mark Polish examine the worlds of the flesh and the spirit, dreams and reality in their third film "Northfork." The town of Northfork Montana is about to drown in the backwaters of a new dam. The year is 1955. The earthly and the heavenly have 48 hours to clear out of Dodge. Of course, there is unfinished business to attend to before the floodgates open. "And the three men I admire most"
"The Father, Son and Holy Ghost,"
"They caught the last train for the coast,"
"The day, the music died." 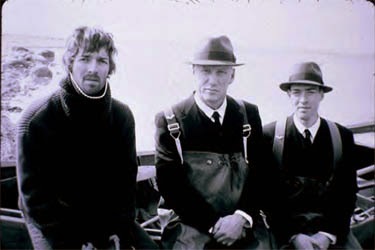 "Northfork" in many ways is a cinematic equivalent of Don McLean's epic ballad "American Pie." Both are full of imagery that evokes deep feelings and forgotten memories. Both are bawdy, earthy and spiritual at the same time. "Northfork" is life after the fall, but before the resurrection. Life goes on, you either accept it and keep moving or you end up like Oregon native Harry Truman who stubbornly rode out Mt. Saint Helens to oblivion. The state of Montana has just completed damming the Northfork River. The town of Northfork (1776-1955) is about to be engulfed in the deluge. 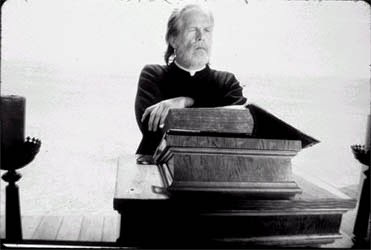 Father Harlan (Nick Nolte) delivers his last sermon to the fleeing townsfolk. His church has lost its back wall. The good Father leads his last sermon with the vast expanse of Montana to his back. One couple is late for mass. Their son Irwin (Duel Farnes) lays in the backseat. Actually, the couple has no intention of attending the mass. They are bringing Irwin back to Father Harlan. Irwin was adopted. He is also very ill. They drop the poor child off as you would return a lemon to a used car dealer. Father Harlan says he will forgive the couple. when Irwin asks where his parents went, the wise man of faith explains that "You don't want to go where they are going." 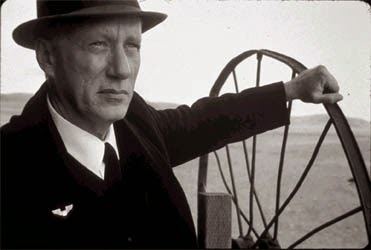 Walter O'Brien (James Woods) sits in his car listening to Lefty Frizzel on the radio. He thumbs a final notice from the Northfork cemetery. 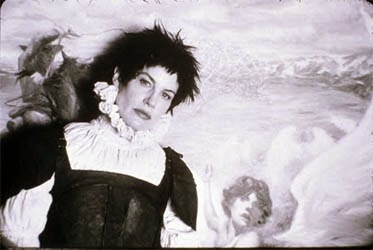 Visions of a coffin popping up in the middle of a lake haunt him as do memories of backseat passion with his late wife. Walter's son Willis (Mark Polish) joins him in the car. Walter shares the letter with his son. "This is so wrong," says Willis. The notice informs the O'Briens that they need to disinter their late wife and mother before the flood. Walter, Willis and four darkly dressed men have yet to leave Northfork. The six are evacuators. In exchange for making sure that the people of Northfork leave before the flood, each evacuator will receive 1.5 acres of the about to be created lakefront property. Each team of two men has one family left to evacuate. Each team of men also has their own issues to deal with. One house in Northfork is inhabited by otherworldly beings. They may be angels, they may be gods and then again, they may be figments of Irwin's feverish imagination: harbingers of peace to take the small boy to eternity. Whatever they are, they are an eclectic bunch. Flowers Hercules (Daryl Hannah) is a hermaphrodite dressed in ancient Greek leather armor and a Victorian era shirt. Cup of Tea (Robin Sachs) is a 16th century English fop. Happy (Anthony Edwards) is a nearly blind nerd with an amazing set of eyeglasses. Cod (Ben Foster) is a silent cowboy. The four are looking for a lost relative: the Unknown Angel. Flowers Hercules believes that Irwin is the missing cherub, while Cup of Tea has his doubts. These three basic storylines form the foundation on which the Polish brothers build their magical tale. Like the best films of the 1970s, "Northfork" doesn't tie everything up into a neat package. I've read numerous debates about the film's meanings. I expected to be puzzled. I had no trouble deciding where I fell concerning the film's more ambiguous parts. "Northfork" is part myth, part fairy tale, and part psychoanalysis. "Northfork" is a life-affirming look at death. The death of dreams, or a way of life and of literal death itself. It will hit each viewer differently. At one point James Woods asks Mark Polish if he has ever smelled death. Mark replies that he hasn't. "Northfork" will affect those who have smelled death quite differently than those who have not. The film also achieves near brilliance for its portrayal of the less than perfect Angels. They make good guardians because they understand the human condition so well. In the Polish universe, these Angels have frailties of their own. I'm comforted by the idea that the Angels that may be watching over me have such a good insight into what it is like to be human. I guess I let you know where I stand on the film's 'Angel question.' The climatic scene, for me takes place when James Woods and Mark Polish check out the house occupied by the heavenly beings. The house is split in half. A small gap divides the two sides, not unlike the thin veil between the worlds of the flesh and the spirit. Both worlds collide here. Life is affirmed and death is accepted. Life goes on. Don't let it pass you by! EI NOTE: I had the pleasure of hanging out with Michael and Mark Polish, Matt Tromans (assistant to Nick Nolte) and producer Jonathan Shelton for a couple of hours after the movie. Check back this weekend for the audience Q&A and my interviews with this talented bunch!